Bay Temp – 66 degrees and falling although daytime temperatures have been in the 70’s still. Sheepshead are fired up in the inlets and bays where rocks, jetties and structure are present. Anchor on the windward side of the structure and cast toward it letting your bait gently sink. Bait of choice is live shrimp and locally caught oysters using nets to scrape the edges of docks. When the current is moving swiftly, up the size of your lead to 2-3 oz. Leader choice is Yozuri pink 10-15 lbs test and a number 2 or 3 Owner mutu lite wire circle. Redfish are also being caught but can be skittish at times with the clear winter water. Bait of choice is live shrimp this time of year or finger mullet if you can find any. Small/medium Pinfish will also work but a becoming more scarce with the temperature drop. You can fish deeper parts of any bridge with these baits and usually be successful as long as the tide is moving. The best way to enjoy a day in the gulf right now is targeting Amberjack. They are plentiful and hungry right now! The Jacks will eat anything frisky this time of year including big live Shrimp, Pinfish, Mullet and Croakers. Find a spot that has a lot of relief (distance from the bottom and apex of structure) and suspend your bait in the water column. Steel is the best but relief is the main factor you need when AJ fishing. You can use various fishing methods to target them if live bait is scarce. Diamond jigs and 4-9 oz butterfly jigs have been deadly. Up your tackle (60-100 lb class) and hold on! 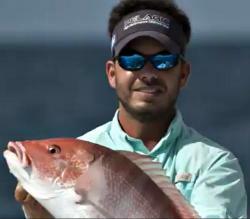 Snapper are everywhere but mainly over live bottom. If using dead bait on the bottom beware of the subtle triggerfish bite – they are bait stealers.You may get lucky and find a nice mangrove or scamp or even a Gag or two. I have also noticed that the bigger snapper are in closer than usual. Kings are scarce so I woudn’t waste my time slow trolling or drifting although you may get lucky and pick one or two up.